Semi-final places as seeding predicted for Egypt’s Mahmoud Helmy and India’s Ronit Bhaja, as play proceeded in the Under 21 Men’s Singles event at the 2018 ITTF Challenge Seamaster Nigeria Open in Lagos on Friday 10th August but the nation to attract the attention was China. In the counterpart Under 21 Women’s Singles event, they attracted the attention even more, the penultimate round is an all Chinese affair; Wang Shu meets Fan Siqi, Sun Chen opposes Guo Yan. The title destined for China; in the Under 21 Men’s Singles event, a place in the final is guaranteed. In the penultimate round Wang Shaobo meets Liu Jialiang, Ronit Bhanja faces Mahmoud Helmy. Impressively, Wang Shu, after beating Nigeria’s Nimota Aregbesola in the opening round (11-2, 11-4, 11-8), reserved her semi-final place courtesy of success against India’s Maria Rony (11-4, 11-4, 11-8), the opening round winner in opposition to Norway’s Ilka Doval, the top seed (11-7, 11-5, 11-7). Similarly, Fan Siqi, the one seeded member of the quartet, listed at no.3, accounted for Nigeria’s Agnes Onoja (11-5, 11-3, 11-3) and colleague Qi Fenjie (12-10, 11-6, 11-9) to book her last four place. Few problems for Fan Siqi, it was the same from Guo Yan as it was Sun Chen. Guo Yan overcame South Africa’s Simeen Mookrey (11-3, 11-6, 11-4) and India’s Sreeja Akula, the no.2 seed (6-11, 11-6, 11-7, 11-7); Sun Chen ousted Sandana Descann of Mauritius (11-2, 11-1, 11-3) and compatriot Wei Wensheng (11-9, 8-11, 11-7, 11-6). Notably, in the opening round, Wei Wensheng ended the hopes of Nigeria’s Esther Orabamise, the no.4 seed (11-1, 8-11, 11-6, 11-3). Comprehensive wins; in the Under 21 Men’s Singles event it was somewhat different. After accounting for Nigeria’s Nurudeen Hassan (11-6, 11-5, 12-10), Wang Shaobo beat Romania’s Rares Sipos, the top seed, by the very narrowest of five game margins (10-12, 11-9, 11-8, 6-11, 11-9) to reserve his semi-final place. Likewise, at the quarter-final stage there were exacting times for Mahmoud Helmy and Ronit Bhanja. Mahmoud Helmy eventually overcame China’s Wang Xinyang (13-11, 10-12, 3-11, 11-9, 11-8); in a similarly close contest, Ronit Bhanja accounted for Italy’s Antonino Amato (10-12, 11-3, 7-11, 11-7, 12-10). Earlier in the opening round, both had beaten host nation players; Mahmoud Helmy had overcome Amadi Omeh (11-5, 11-7, 11-9), Ronit Bhanja had beaten Tobi Falana (11-7, 11-6, 11-5). Hard fought contests, for Liu Jialiang life was somewhat less testing. 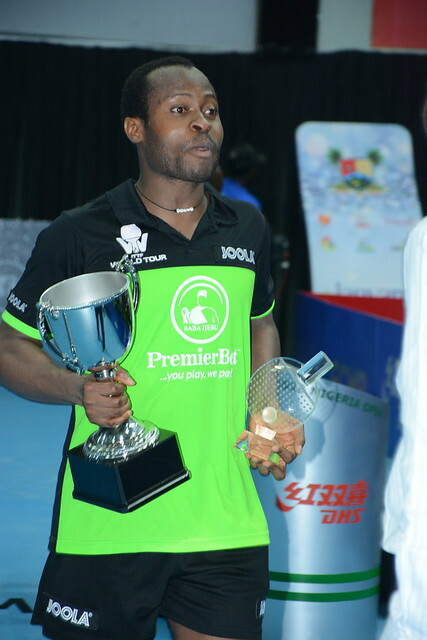 He accounted for Nigeria’s Joshua Oladiran (4-11, 11-6, 11-3, 11-5), prior to ousting Argentina’s Horacio Cifuentes, the no.3 seed (11-7, 11-8, 12-10). The semi-finals and finals of both the Under 21 Men’s Singles and Under 21 Women’s Singles events will be played on Saturday 11th August.